Whilst I was in India last year I sampled some outstanding food. Moreish snacks are my favourite Indian food and every region in India has their specialities. Despite travelling in mainly Northern/ middle India, it was probably Southern Indian food that I ate the most. Who can resist a hot crispy dosa? Definitely not I! Along side dosas, idlis, gallons of sambhal and chutneys, Mendu Vada were ordered time and time again on my travels. If you like South Indian food as much as I do then you have to try these. They are so simple and require nothing more than a blender to make! The mixture can be kept in the freezer, ready to defrost and fry whenever you fancy a treat. I don't think the chutney I have chosen for this recipe is authentic in a any way, but it works. And it is a stunner of a chutney. The sweetness from the apple is a revelation which really compliments the kick of chilli. Any left overs sit very happily in a chutney cheese sandwich! 1. Start with the mendu vadas. Soak your lentil and rice in water over night. This will soften them and make them easy to blend. 2. Drain the rice and dal and put into a blender. Add all the other ingredients - coriander, cumin, green chilli and seasoning. 3. Blend into a smooth paste. You may need to add a touch of water to loosen the mixture. You are looking for a thick greek yoghurt consistency. (Watch the video above at 0.14s you'll see what I mean). 4. Heat some oil in a deep fryer. You want a medium heat otherwise the outside of the vada will cook too fast and the inside will be raw. Use wet hands to handle your paste otherwise it will stick to your hands! Test the heat of the oil using some of the mixture - just gently drop a blob in. You want the oil to bubble and sizzle. The mixture will turn golden but not brown over about five minutes. 5. Now use your wet hands to shape the vada into round patties. Make a whole in the centre of each one before you drop it into the oil. I used a back of a wooden spoon to make mine! Once cooked drain the vadas onto some kitchen towel and keep warm in a low oven. 6. Meanwhile make the chutney. Simply whiz up all the ingredients, except the yoghurt, in a blender. Taste and check for seasoning. Finally stir in the yoghurt before serving. The chutney will last in the fridge for up to a week. These are such a satisfying treat and so easy to make. I hope you all enjoy giving them a go! 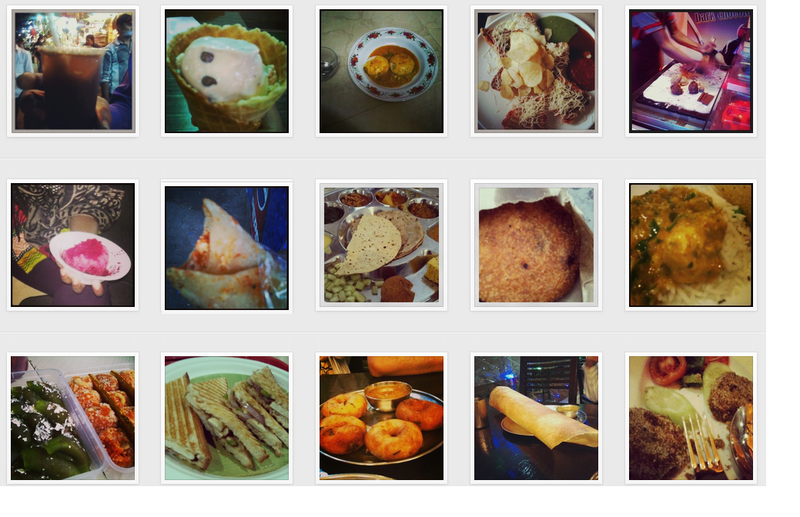 In the mean time you can see what I've been eating on Twitter and Instagram.